The Rangers have one more game tonight in Boston to wrap up a busy January, then go on a nine day break for their bye week and the All Star break. The Blueshirts have just three wins this month, going 3-6-0 thus far. However, their three wins have come in their last four games, so they are riding a bit of a hot streak at the moment. This comes right as Tony DeAngelo was paired with Marc Staal. There’s no correlation there, just coincidental timing that I thought was funny. Boston is one of the better non-Tampa teams in the Eastern conference. They currently sit one point behind Toronto and third in the Atlantic. They are a tough opponent, which might be what #TheVision needs for the tank. Remember though, players don’t tank, and you don’t want them to try to lose. Keeping Mats Zuccarello hot to boost that trade value would be nice. Zuccarello would fit in on Boston’s second line RW spot, though. Makes you think. Tuukka Rask gets the start. Crazy Prediction: No disallowed goals on bad offsides reviews. "Game 48: Boston and then a long break", 5 out of 5 based on 2 ratings. I would love to see Buch on the same line as Strome and Chytil. At some point the Ranger organization has to give the young Ruskie a opportunity to see what he is made of. If it doesn’t work out then move on with him. id look to package him with zucc at deadline to get a first. Rask got hit hard. 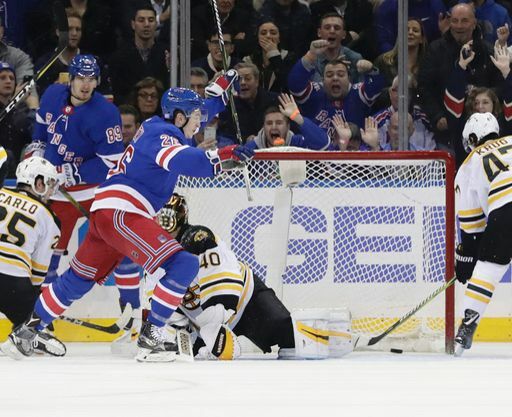 Chytil is a big kid who was flying and McAvoy slammed him right into Rask’s head and shoulders. That was dangerous. Zuc..the master of the red dot. Holy HeeeeTaaaal ! Wow ! Howden got a good hit on the hands on the first goal. And who said face offs aren’t important?!?!? That was an excellent win. Beat a good team. Yay! See you all in 10 days! The Bees had the puck a lot but the Rangers did something that will keep them in games against anyone: They DEFENDED well in their own zone. They had great gap control and they closed down the Bees’ passing lanes. The Rangers broke up a lot of the Bees’ offensive plays with sticks and just getting in the way of Boston’s offensive flow. Keep it simple!! These D pairings are actually working (gasp, DeAngelo and Lindgren make a difference?). Shatty is looking more like the old Shatty and Skjei seems to have settled down. Even Staal has been pretty good. Chytil, Zib, and Zuc were the offensive stars last night. IMO, Zib is near an elite player, and always was, his issue was staying healthy. Chytil is the real deal, wow what a move, and he knew he was going to get plastered. I wonder how McAvoy feels today about that stupid hit that took out his goalie. Buch was brutal. One sequence in the first where he had 2 brutal giveaways and then a needless icing. I mean WTF is he thinking about? That being said, nailing him to the 4th line is still stupid. Fun fact: Georgiev has more points than McLeod does. Yes, that’s true. So let me see, Fast has to go into concussion protocol for a possible hit to the head, but no penalty is to be called for the hit that caused that concussion protocol. F–king Mickey Mouse league. Congrats Henrik!! Most 15 win seasons to start a career and moving up the ladder for all-time wins. Well deserved. That save on the deflection towards the end of the game was just brilliant. Is it the D is playing better or they are playing better as a complete unit with Centers actually doing their jobs? Hell I’ve been seeing the wingers actually helping out (finally ) in the D zone .. ( one more win and Hank ties for #6 ?? ) . Seemed a lot of calls were missed , slash on Howden’s turn over was questionable. Stick check a bit high on the hands was a big one but I never got to see a differen Angle on it. With 4 blind mice on the ice any questionable play should be called. Not will worry about it the next few days and make a decision. With all the CTE stuff going on eventually there’s not gonna be much contact in the game. Hey bro, I agree that the team is playing better as a unit, defensively, no question. That’s where the good gap control and defending the passing lanes come in. But even on the back end, there seems to be less “running around” and more continuity back there. It’s not perfect, but it’s better. I like Lindgren a lot, so far. Buch did have some early giveaways but the 4th line continues to cycle the puck in the opposition end. Not only does this give the Ranger possession time but they created themselves several scoring opportunities. Unfortunately having Cody McCement hands as the trigger man they can’t capitalize on some nice Buchnesvichs feeds. Highlight reel goal by Chytil again, the kid has some talent. McLeod has no business on the team and Buch has no business on the 4th line. hopefully some trades will free up some spots for buch.